Whether you're after something quick to grab and go, or want to sit and enjoy a leisurely bite in the comfort of the dining area before your journey, there's something for everyone at Pork & Pickle. Why eat at Pork & Pickle? Pork & Pickle in Manchester Airport Terminal 3 offers passengers a range of traditional British deli fare, including pastries, delicacies and breads, working with local suppliers for its range of local cakes and treats, pork pies and its famous pork sausages. 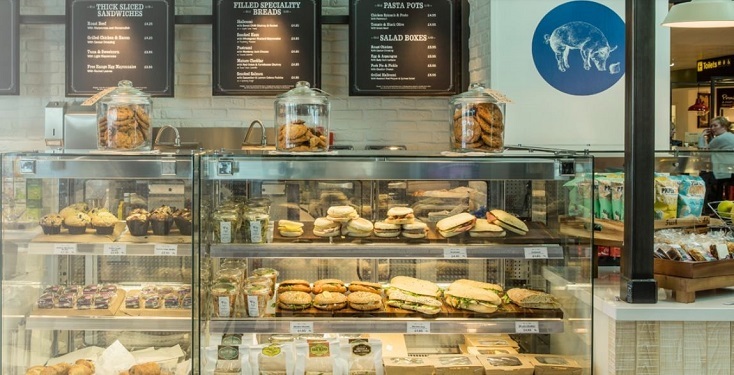 Serving Fairtrade Kimbo coffee and a selection of homemade sandwiches, yoghurts and salads, whether you're after something quick to grab and go, or want to sit and enjoy a leisurely bite in the comfort of the dining area before your journey, there's something for everyone.